Royal Carriage is the oldest continually-operating sightseeing carriage company in America! Let us handle your wedding with the same efficient, personal touch that has distinguished us for over 75 years. Give your wedding a royal touch by traveling to your ceremony in our luxury wedding carriage. This beautiful white coach is drawn by a single elegant carriage mule with a driver dressed in a tuxedo. 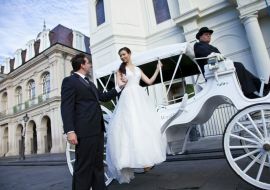 In New Orleans, our mule-drawn carriage is a wonderful way to enhance your wedding day. After all your efforts of planning your dream day, gliding along in our elegant wedding carriage will allow you the perfect opportunity to simply relax....making the moments last! Our elegant white vis-à-vis wedding carriage seats up to four comfortably, and is uniquely designed to be enjoyed rain or shine! The carriage is absolutely beautiful with the top up or down. "We hired the carriage to drive that Father of the Bride and the Bride to the wedding venue. What an arrival! The guest were all taking photos. It was a nice way for the two of them to chill before the big event. The driver took them on a nice little tour of NOLA before the wedding. It was worth every dime. Thanks, Royal Carriages." "Excellent service from the time of its' planning with Sherman to the actual ride for 30 guests, these guys are a class act and provide Southern Charm every step of the way. Highly recommended!" The novelty of carriage transport is ideal for short distance travel. 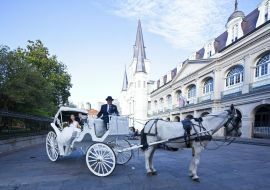 Our wedding carriage transportation services travel within a 1-mile radius of the French Quarter. Locations outside of this 1-mile radius will be taken into consideration at an increased rate. As you travel at a relaxed pace, you are able to enjoy this day you have worked so hard to plan for. Be sure that the package you purchase allows enough time for a receiving line, photos with the carriage, and travel time to your reception. Royal Carriages services the French Quarter, Central Business District, Marigny, Bywater, City Park and does not service Audubon Park, Gentilly, Metairie, West Bank, North Shore, etc. Feel confident that what you see is what you get. Our photos are recent images of our well-maintained wedding carriage. Royal Carriages prides itself in having beautiful carriages, exceptional animal care, and a professionally trained staffed that will be dressed appropriately for the occasion. Enjoy our VIP Wedding Services for up to 1-hour. Within the hour, you'll arrive at your desired location, enjoy a historic tour (optional - no extra cost), and pose for pictures in the mule-drawn wedding carriage. Enjoy our VIP Wedding Services for 1.5 hours. Arrive at your desired location and pose for pictures. The carriage will return at your scheduled time to provide you with a historic tour (optional - no extra cost) or a quiet romantic ride for up to 1 hour before returning to your final desired location. Transport your wedding party with our 8-passenger limousine carriages. In 2014, Vincent called Royal Carriages to set up a surprise marriage proposal on a carriage in New Orleans. He wanted this special moment to be unforgettable. In addition to purchasing a private carriage for his surprise marriage proposal, he also contacted a local photographer, Babs Evangelista, to capture the moment via her French Quarter balcony. "I was agog at the sheer romance of his proposal and helped him concoct a plan that involved a balcony, a talented driver, and a very well-behaved mule. The carriage rounded the corner and I was ready with my zoom lens. It stopped beneath my balcony and BAM! Vincent presented a ring in a light up box. It was on. Amy was smiley and happy and of course said yes." As is a tradition in New Orleans, Brittany & Tyler ended their wedding with a Second Line parade. The bride and groom carried feathered umbrellas as guests waved personalized handkerchiefs. 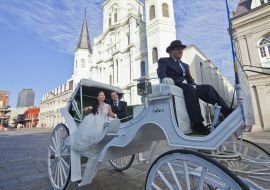 As the parade came to an end, the couple climbed into their wedding carriage and took a relaxing ride through the French Quarter. "It was so magical getting to be alone, sip champagne, and listen to the sounds of the city," says Brittney. "I couldn't have asked for a more beautiful ending." Meet Monica and Daniel who chose to have their ceremony at the very historic Immaculate Conception, and then it was only a short carriage ride away to the Federal Ballroom at the Security Center for their wedding reception. What an incredible way to celebrate forever together! 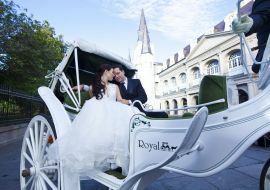 Royal Carriages provides romantic private carriage rides that are perfect for surprise engagement proposals. Let us arrange something amazing for you! I booked this tour for my mom and dad (the haunted evening tour) because of all the great reviews! My parents are picky but they had nothing but great things to say about their tour. They said their driver/guide was friendly, knowledgeable and gave them some inside stories about the hotel they were staying in, and that personal touch made them feel special! Looking forward to booking my own tour when I visit NOLA again. 2019 © Royal Carriages. Website managed by The Von Mack Agency.